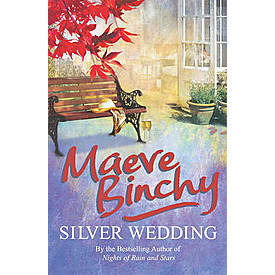 Maeve Binchy, the Queen of Characters, has done it again with Silver Wedding; writing every character in such a way that the reader is immediately planted in the character’s shoes. In nearly every book I’ve read by Binchy, she has multiple characters that the reader gets to know well. In Silver Wedding, the reader is given eight pairs of shoes to fit into. Divided into chapters, each character has a very unique life in various places, but in the end they all come together for the Silver Wedding in London. Anna is the eldest daughter of Desmond and Deirdre Doyle who are celebrating their 25th wedding anniversary. The Doyle’s are planning more than celebrating, as their marriage isn’t full of love as some might be. Anna who unhappily works at a bookstore because her boyfriend, Joe Ashe is unemployed and she needed stability. Anna’s brother Brendan, living over in the west of Ireland, will be of no help in planning the anniversary and neither will her young sister Helen who is struggling to be accepting into the convent where lives. Father Hurley, the priest who married Desmond and Deirdre Doyle in a shotgun wedding also living in Ireland is invited to the celebration. Maureen, Deirdre’s maid of honor and old flame of Frank Quigley has the sad situation of dealing with her mother’s recent death and another surprise she discovers as she sorts through her mother’s papers. Frank Quigley, married to Italian Renata Palazzo, daughter of his boss finds himself in a long-term affair with Joy East, the Palazzo company’s designer. Reading about each character in a chapter was intriguing. It let the reader fully immerse in the character and learn about who they really were. Each character had its own life with their job, their worries and the connection to Desmond and Deirdre Doyle. The difficult part was keeping track of each character. Since each chapter was so in-depth with each character, it made it harder to remember everything about the character in the previous chapter, especially when you put the book down for a day or two. It was more like eight short stories, which were brought together in a ninth short story at the end. In addition to the eight characters who are the focus, there are an additional 30 characters mentioned throughout the book. I may have missed a few, but this brings the counted total to 38 characters. It was hard to keep track of each person and how they fit in at the end. This book has a table of contents at the front, but a family tree and character web may also have been helpful. Binchy could have aided the reader just a little more when she started a new chapter and referred to a character she already mentioned by giving a small reminder of who they were or only referring to the minor characters instead of naming them. Silver Wedding brings everyone together again in the end, but it is advisable to read the book from start to finish in one sitting or at least without taking too many breaks. With all the characters, this book requires careful attention.